Time on 3/15/2017 until 11:59 p.m. Eastern Time on 4/16/2017 (the “Entry Period”). Sponsor’s computer is the official clock for the Promotion. Alternative Method of Entry: On a plain piece of 3”x5” paper hand print your first and last name, street address (no P.O. Boxes), city, state, zip, date of birth (mm/yyyy), name of promotion, e-mail address (optional) plus daytime and evening telephone numbers including area code. Mail your entry in an envelope no larger than #10 (business-size envelope) with sufficient postage affixed, to: General Assembly, Attn: Marketing Department, 902 Broadway, 4th Floor, New York, NY 10010. Limit one entry per outer-mailing envelope. Entries must be received by 4/16/2017. No mechanically reproduced entries permitted. Not responsible for lost, late, illegible, mutilated, misdirected, postage-due entries or entries not received in time for the random drawing. 2. Eligibility. Eligibility to participate in the Promotion or to win prizes is limited to individual persons at least eighteen (18) years of age at the beginning of the Entry Period. Limit one (1) entry per individual. Multiple participants are not permitted to share the same email address. Any attempt by any participant to obtain more than the stated number of entries by using multiple/different email or addresses, accounts, identities, registrations and logins, or any other methods will void that participant’s entries and that participant may be disqualified. Registrations or submissions generated by a script, macro or other automated means are void. In the event of a dispute as to any entrant, the authorized account holder of the email address associated with the entry will be deemed to be the entrant. The “authorized account holder” is the natural person assigned an email address by an Internet access provider, online service provider or other organization responsible for assigning email addresses for the domain associated with the submitted address. Each potential winner may be required to show proof of being the authorized account holder. Entrants who disregard these Official Rules are not eligible to participate or win. Directors, officers, employees, contractors and agents (and their immediate families and household members) of the Sponsor, its parents, affiliates, subsidiaries, advertising and promotion agencies, or any other company involved with the design, production, execution or distribution of the Promotion, and persons who were awarded a prize or received other promotional consideration from the Sponsor within six (6) months prior to the beginning of the Entry Period are also not eligible. The Sponsor’s determination of eligibility, in its sole discretion, shall be final. 3. Drawing. The winner will be selected by a random-chance drawing. The odds of winning depend on the number of eligible entries received during the Entry Period. All decisions and selections are final and binding. 4. Prize. 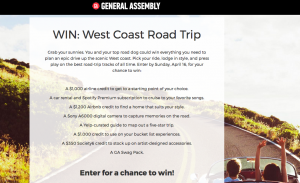 The Winner will receive: A $1000 airline credit, a $1,200 Airbnb credit, $800 car rental credit, a Sony A6000 camera, $1000 spending money, a 1-year Spotify Premium Subscription, and a GA Swag Pack. Approximate retail value $5000 (the “Prize”). Entrants acknowledge that any any costs incurred in redeeming the prizes, outside the listed items above, are not included in the Prize. In no event will the total value of the prize exceed $5,000. Sponsor makes no warranties with regard to the Prize. The Prize is not transferable and the winner has no right of substitution (in cash or otherwise). Sponsor reserves the right to substitute a prize of equal or greater value in the event of unavailability. Winners are responsible for any taxes, customs, duties and like amounts connected with the prizes. 5. Winner Notification. The winner of the Prize will be notified by e-mail by April 20, 2017. Sponsor is not responsible for any delay or failure to receive notification for any reason, including inactive email account(s), technical difficulties associated therewith, or winner’s failure to adequately monitor any email account. Sponsor may require the prize winner to execute an affidavit of eligibility, publicity release (except where prohibited), liability waiver and/or IRS Form W-9 (if required by IRS regulations) prior to the delivery of any prize (collectively, “Affidavit”). If the prize winner does not respond to the notification within 24 hours, is found to be ineligible, fails to execute the Affidavit or other documentation required by Sponsor and/or the Prize is returned as undeliverable, the Sponsor reserves the right to deem such winner to have forfeited the Prize, and another prize winner in a second random-chance drawing, or to elect not to award a prize at all. The Prize will be awarded within approximately 24 hours of the winner’s complete response to notification. By entering or accepting any prize, winner allows Sponsor to use the winner’s name, photograph, likeness, voice, prize information, and biographical information for publicity and promotional purposes without further compensation where permitted by law. Except where prohibited, participation in the promotion constitutes participant’s consent to Sponsor’s use of participant’s name, likeness, voice, opinions, biographical information, hometown and state for promotional purposes in any media without further payment or consideration. 6. Conditions of Participation. By submitting an entry for this Promotion, each participant agrees to be bound by these Official Rules and the decisions of the Sponsor, and to accept delivery of any prize won based upon availability. Sponsor, Elle, theSkimm, Yelp, Society6, and OliviaPalermo.com (collectively, the “Sweepstakes Entities”) are not responsible for any printing errors in these Official Rules or otherwise in any materials provided in connection with the Promotion. The Sweepstakes Entities will not be responsible for lost, late, misidentified or misdirected Submissions, or telecommunication or computer hardware or software performance, errors, delays or failures. If, for any reason, the fairness or integrity of the Promotion becomes compromised, or the Sponsor’s administration or fulfillment of the Promotion becomes impracticable, the Sweepstakes Entities reserve the right to terminate or modify the Promotion, and to disqualify any individual who tampers with the Submission process or the administration of the Promotion. 7. Winner’s List. Individuals may request the name of the winner by submitting a self-addressed stamped envelope by April 16, 2017 to General Assembly Promotion Winner’s List Request at 902 Broadway, 4th Floor New York, NY 10010. Vermont and Washington residents may omit postage. 8. Disclaimers, Dispute Resolution and Limitations of Liability. THE SWEEPSTAKES ENTITIES MAKE NO REPRESENTATIONS OR WARRANTIES OF ANY KIND, EXPRESS OR IMPLIED, REGARDING ANY PRIZE OR YOUR PARTICIPATION IN THE PROMOTION. By entering the Promotion, each entrant hereby releases, and agrees to defend, indemnify and hold harmless the Sweepstakes Entities, those working on its behalf, and each of their respective officers, directors, representatives, employees, agents, successors and assigns, from any damage, injury, death, loss or other liability, either at law or equity, whether known or unknown, asserted or non-asserted, that may arise from or in any way relate to participation in this Promotion or the awarding, acceptance, use or misuse of the Prize or any other substitute prize. Any and all disputes, claims, and causes of action arising out of or in connection with this Promotion shall be resolved individually, without resort to any form of class action. This Promotion shall be governed by, and construed in accordance with, the laws of the State of New York, regardless of conflicts of laws principles. Any action or litigation concerning this Promotion shall take place exclusively in the federal or state courts sitting in New York County, New York, and each entrant expressly consents to the jurisdiction of and venue in such courts and waives all defenses of lack of jurisdiction and inconvenient forum with respect to such courts. Each entrant agrees to service of process by mail or other method acceptable under the laws of the State of New York. ANY CLAIMS, JUDGMENTS AND/OR AWARDS SHALL BE LIMITED TO ACTUAL OUT-OF-POCKET COSTS ASSOCIATED WITH ENTERING THIS PROMOTION. REGISTERED CONTESTANT HEREBY WAIVES ANY RIGHTS OR CLAIMS TO ATTORNEY’S FEES, INDIRECT, SPECIAL, PUNITIVE, INCIDENTAL OR CONSEQUENTIAL DAMAGES OF ENTRANT, WHETHER FORESEEABLE OR NOT AND WHETHER BASED ON NEGLIGENCE OR OTHERWISE. 10. Social Media Platform. Each entrant hereby releases, and agrees to defend, indemnify and hold harmless Facebook, Twitter and Instagram (the “Social Media Platforms”), and each of their respective officers, directors, representatives, employees, agents, successors and assigns, from any damage, injury, death, loss or other liability, either at law or equity, whether known or unknown, asserted or non-asserted, that may arise from or in any way relate to this Promotion. Content provided in connection with this Promotion is being provided to the Sponsor and not to the Social Media Platforms. The Promotion, the Sponsor and any other company or product featured in connection with this Promotion is not sponsored, endorsed or administered by or associated with any Social Media Platform. 11. Sponsor. The Sponsor of this Promotion is General Assembly Space, Inc., located at 902 Broadway, 4th Floor, New York, NY 10010. If entrant no longer wishes to receive information concerning Sponsor’s sweepstakes or promotions, please notify Sponsor by email at legal@ga.co. By entering the Sweepstakes, you acknowledge and agree that the participating companies: Yelp, OliviaPalermo.com, General Assembly, Society6, Elle, theSkimm will use your information, including, without limitation, your e-mail address, for general solicitation, marketing, or other business or promotional activities in connection with the services and products provided by the participating companies. You may at any time revoke the use of such information by providing written notice to each participating company. By participating in the Sweepstakes, you agree to release and hold harmless Sponsor, its parent, subsidiaries, affiliates, and each of their respective officers, directors, employees, and agents (the “Released Parties”) from and against any claim or cause of action arising out of participation in the Sweepstakes or receipt or use of any prize, including, but not limited to: (a) unauthorized human intervention in the Sweepstakes; (b) technical errors related to computers, servers, providers, or telephone, or network lines; (c) printing errors; (d) lost, late, postage¬ due, misdirected, or undeliverable mail; (e) errors in the administration of the Sweepstakes or the processing of entries; or (f) injury or damage to persons or property which may be caused, directly or indirectly, in whole or in part, from entrant’s participation in the Sweepstakes or receipt or use of any prize. You further agree that in any cause of action, the Released Parties’ liability will be limited to the cost of entering and participating in the Sweepstakes, and in no event shall the Released Parties be liable for attorney’s fees. You waive the right to claim any damages whatsoever, including, but not limited to, punitive, consequential, direct, or indirect damages. 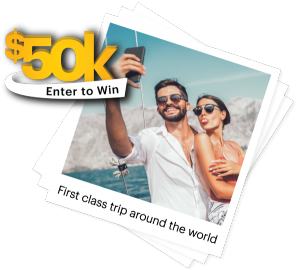 By entering the sweepstakes, you agree that Innovation Brands Corp. can collect and use such content and information to help provide and improve our services, personalize content and measure the effectiveness and reach of our product. You may at any time revoke the use of such information by providing written notice to Innovation Brands Corp.